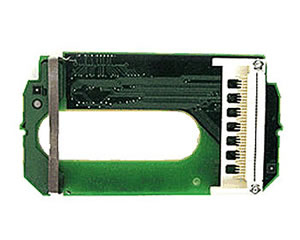 This original Apple adapter card is required to fit an Airport card to any Airport capable slot loading iMac G3. The adapter card can only take the original 11mbps 802.11b Airport card which plugs into the adapter. The adapter card then plugs into the logic board next to the main memory slots accessed through the flap underneath. See Apple tech document.